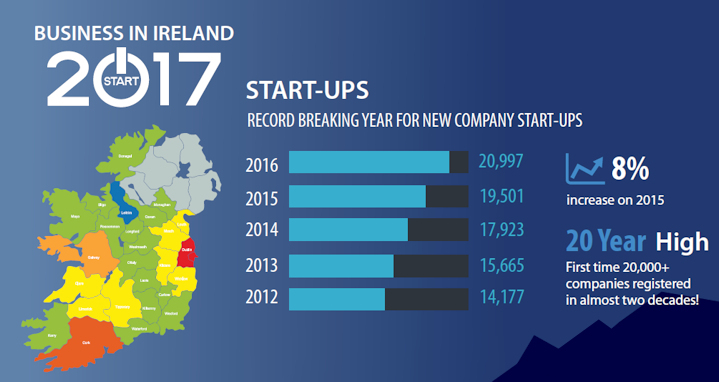 20,997 Irish company start-ups were recorded in 2016 the second highest figure for new companies seen in Ireland in the last 36 years. That figure for company start-ups was 8% up on 2015's total of 19,501 and represents an average of almost 404 new companies being formed weekly in 2016. The finance and construction sectors performed strongly in 2016. A total of 2,959 new finance companies were set up this year, up 44% on 2015 (2,061); construction was up 14%, from 1,640 new companies in 2015 to 1,876 in 2016. Professional services was the most popular industry for new company start-ups: 4,079 were established in 2016, a 5% increase on 2015 (3,891). The second most popular industry was finance, followed by wholesale and retail (2,204), up slightly on last year (2,190). Social & Personal services and Construction (up 8% and 14% respectively) were the fourth and fifth most popular industries. Dublin accounted for the vast majority (45.5%) of all new company start-ups in 2016, Cork's overall share of company start-ups last year was up 1.4% on its 2015 figure - this is the biggest increase in market share recorded by any county in 2016. A total of 984 insolvencies were recorded in 2016, a 10% drop on 2015's figure of 1,096. This is the first time fewer than 1,000 insolvencies have been recorded in a single year since 2008. Most industries recorded an overall drop in insolvencies. Real estate sector insolvencies decreased by 8% on 2015 (from 130 to 120), wholesale and retail by 26% (158 to 117), hospitality by 6% (113 to 106), manufacturing by 20% (90 to 72) and motoring by 9% (33 to 30). The most insolvent industry was professional services which accounted for 213 insolvencies - however, this was still a small drop on 2015's figure (215). Construction was the second most insolvent industry (159), but the number decreased by 4% on 2015 (166). To find out more about any Irish companies, businesses, directors or individuals - simply login to your account today.